Trade Show Signage that sets you apart from the competition! Make the most of all of every opportunity with Trade Show signage that stands out! At a trade show you have one opportunity to stand out of the crowd. Allow us to help you come up with a trade show signage solution that will work for your budget and your needs. Don't miss this chance to establish your brand and attract customers. 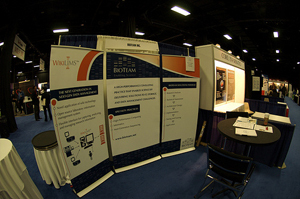 Your Trade Show signage can make or break your trade show experience! If you have a question about your branding or design, allow our professional graphic designers to step and create a design that will work for all of your trade show needs. Attracting customers has never been tougher, you can't afford to miss out on the your Trade Show opportunity! As Port Washington and Long Island's leader in custom graphics, we got you covered!.